Whether you drive a cruiser, “crotch rocket” or moped, it’s important to keep your motorcycle clean and safe from the weather above. When you leave your motorcycle parked outside without covering it up you’re leaving it exposed to natural and man-made elements. 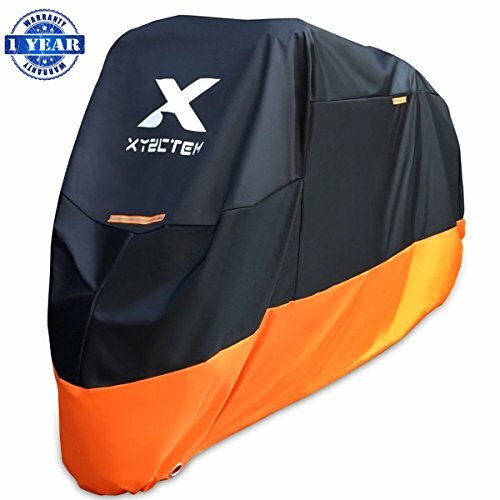 From rain to dust to industrial pollutants, your paint job, windshield and seat are constantly being bombarded; that’s why you need the XYZCTEM Motorcycle Cover to keep it looking clean and new for years to come. Click ‘Add to Cart’ now to start protecting your Harley Davidson, Honda Goldwing or other large cruisers with all-season, waterproof protection.IMPROVED WEATHER PROTECTION – Made of high quality NYLON OXFORD material,protect your motorcycle against rain, dust, heat, tree sap, damaging UV rays & inclement weather with top to bottom coverage. BREATHABLE FABRIC – Unlike other car and vehicle covers that trap heat, our breathable bike cover releases heat, moisture and condensation to protect your seat. UNIVERSAL FIT – Designed to fit multiple motorcycles up to 108 inch-from Harley Davidson to Honda,Suzuki to Kawasaki,Yamaha-our cover fits most on and off-road standard-sized bikes. GENTLE ON PAINT – Protect your vehicle with a premium motorcycle cover that’s non-scratch, non-abrasive, mildew resistant, lightweight and soft on paint. 1 YEAR WARRANTY &ENHANCE DURABILITY – No issue on return or exchange between12 months,Each motorcycle cover is made with double-stitched, windproof fabric that stands up to even the toughest weather.